This video will teach you how to import your data into the application. There are many different options in finding and identifying your data using are application. After watching the video you should have a great understanding of how the AI works in the application. Getting data into a Microsoft Excel Spreadsheet or Access Database can be time consuming watch this video to see how easy it can be done using Import Export (MS Office Tool). After watching the video you should be able to export with one two or even three clicks of your mouse button. The video will teach you all the ins and outs of finding data. 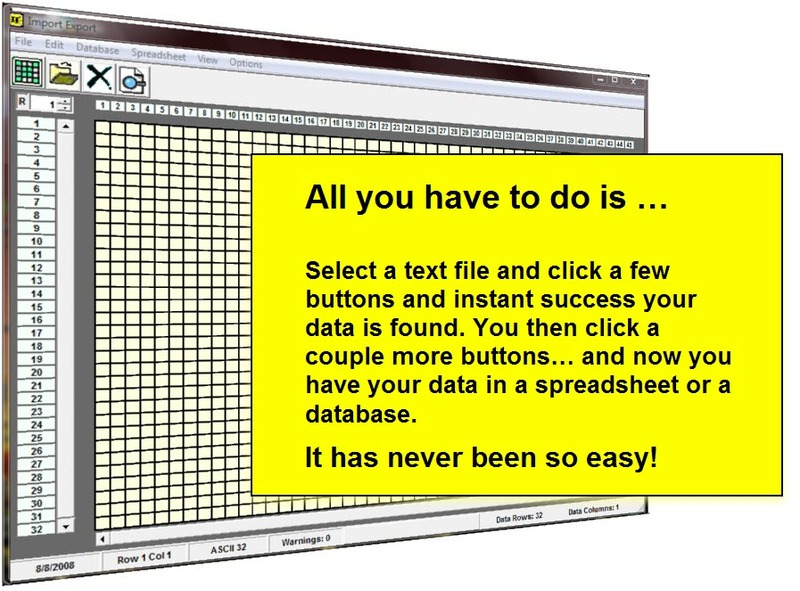 After watching this video you will be able to take any text file and quickly export only selected data into a Microsoft Spreadsheet or Access Database. The video teaches other options like help, printing, and changing screen colors. This video will show you how to install the demo on Windows Vista 64 Bit Machines. If you have Vista 32 Bit you do not have to watch this video, <?xml:namespace prefix = o ns = "urn:schemas-microsoft-com:office:office" /> Note: When buying the software Norton Anti-Virus might display a warning message. Just click acept becasue your pre-registation is automatically sent to us. All Training Videos Note: Videos will not work using the 64 bit version of Internet Explorer This video has a brief explanation of our software. It is an easy visual way to get an understanding of what the software is about. After watching the video you should have an all around high level description of how it can quickly get you what you need into your spreadsheet or database in MS Office.